Gathering for a meal with friends before the hustle of holiday events is how Megan and Mike Gilger of The Fresh Exchange usher in a sense of gratitude. 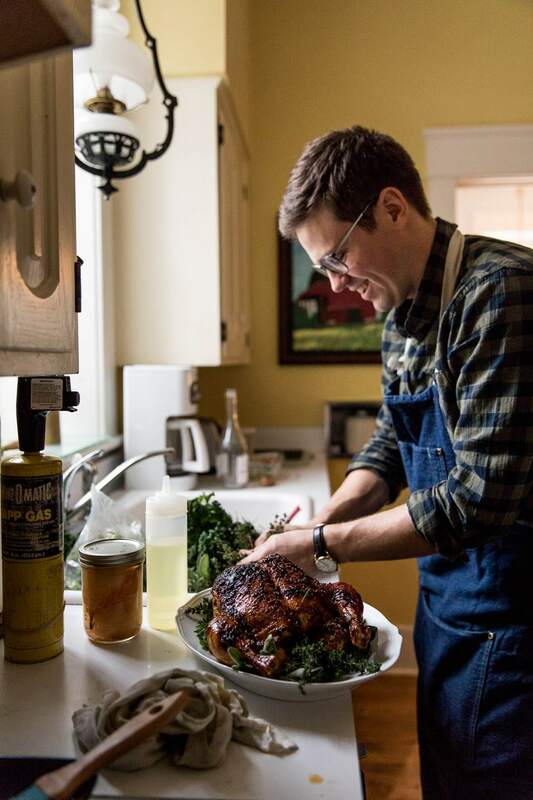 They share tips and recipes for a Friendsgiving feast in Northern Michigan. It is drizzling and the lake has taken on dark gray tones. Two crackling fires and the scent of wood smoke fills the air at Fieldguide Farmhouse in Central Lake. We instantly feel welcomed and are hugged by all. 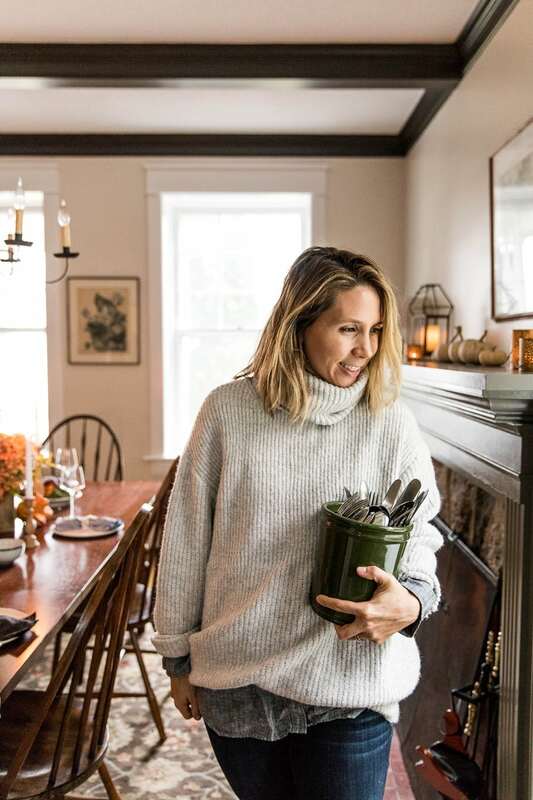 We’re here to enjoy a Friendsgiving with friends: chef Nicholas Roznowski from COOP, floral designer Kalin Sheick from Sweetwater Floral, and our host Lee Maynard, owner of this 1910 four-square fieldstone farmhouse inn. Nicholas is in the kitchen opening jars of pumpkin preserves and poached pears saved from the harvest a few months prior. The air is heady with roasting vegetables and fresh herbs. There is no lack of goodness in this scene. 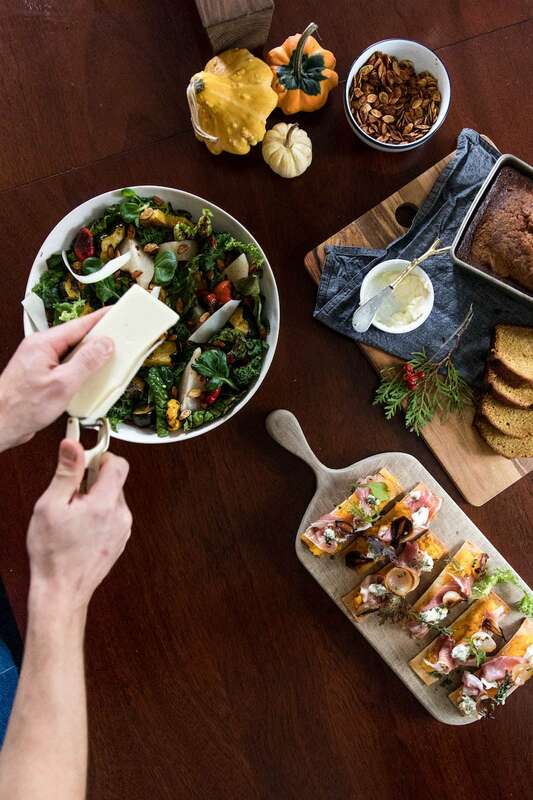 Creating a gathering of friends is important any time of year, but it seems as we close out fall and we draw closer to the holiday season our gatherings with those we love and enjoy becomes an even more exciting part of the season. Our little crew all has something to offer. Each brings expertise to pull off a simple and beautiful gathering that pays respect to the beauty of this place Lee has created. Together we prep. Lee stokes fires to keep the house warm and inviting. 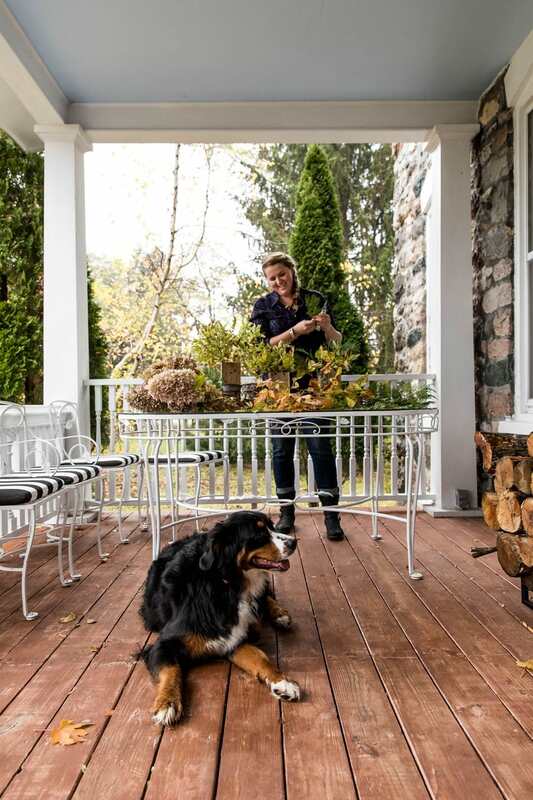 Kalin pulls together table arrangements out on the porch with Maple her Bernese Mountain Dog. I tuck evergreen stems in the rope-tied napkins—just some cedar cut from the hedge. There is nothing better than using what is available to us right outside. It isn’t long before Nicholas brings out snacks and things to be shared as we all work. We stop and clink cheers, refuel and talk about how thankful we are to enjoy life in this beautiful place. As the sun lowers in the sky, Nicholas pulls the chicken out of the oven for dinner. Lighting candles and filling wine glasses is all that is left to be done. We each take a seat and the conversations from the afternoon carry to the table nearly seamlessly. We make jokes about who is the head of the table and reference the dinner scene in Chevy Chase’s Christmas Vacation, but we know better than to think Nicholas’s bird is anything but perfect. Sure enough, it’s as amazing as we could have dreamed. The food, the laughter, the wine, and even the coming together to do the dishes. As our conversation continued well past the meal and the fires were stoked again and again, we felt warm and filled in the way only an intentional and simple evening with friends in November can warm you. The snow began to stick for the first time as we drove home that night, but the evening left us ready and prepared for the winter months ahead. No need for anything fancy—neutral plates and napkins work great. Don’t overthink it. The food is the centerpiece. 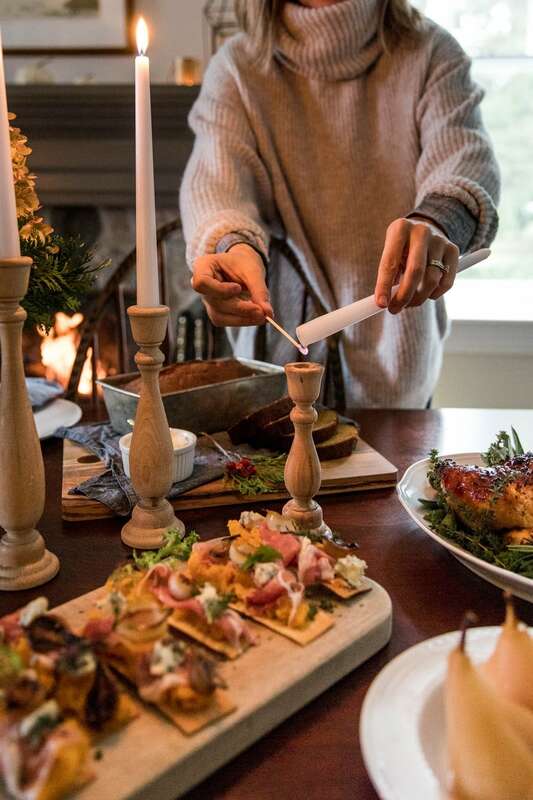 Use varying heights of candles to warm your guests’ faces in the candlelight during the meal. Simple white tapers are perfect. Allow everyone to have a task they oversee. Giving guests and friends a chance to participate makes everyone feel a part of the experience. Natural elements make all the difference—I like dried lavender, dried hydrangea blooms, or sprigs or branches you find on a walk. Up North this time of year offers amazing foraging opportunities. On the evergreen side, November is the best time to start working in “holiday” greens subtly and they hold so well in arrangements. Look for cedar, pine and spruce as great starters. Your vessel is the easiest way to make a statement—think beyond traditional vases. I like to hunt for them at True North Interior Design & Antiques in Charlevoix. 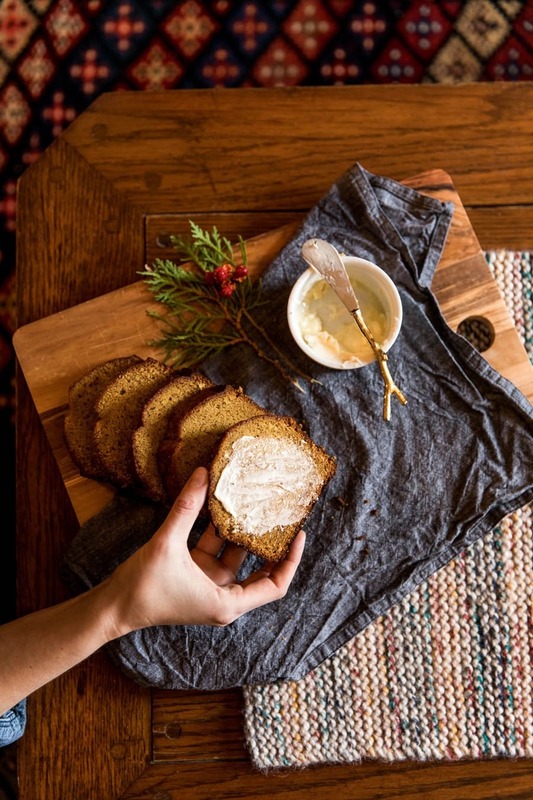 Create a cheese and crackers spread like none other. (To cook with fresh pumpkin, bake it as you would any winter squash. Cool then scrape out the pulp and purée in a blender/food processor.) Mix and match cheese and accompaniments on flatbread crackers. 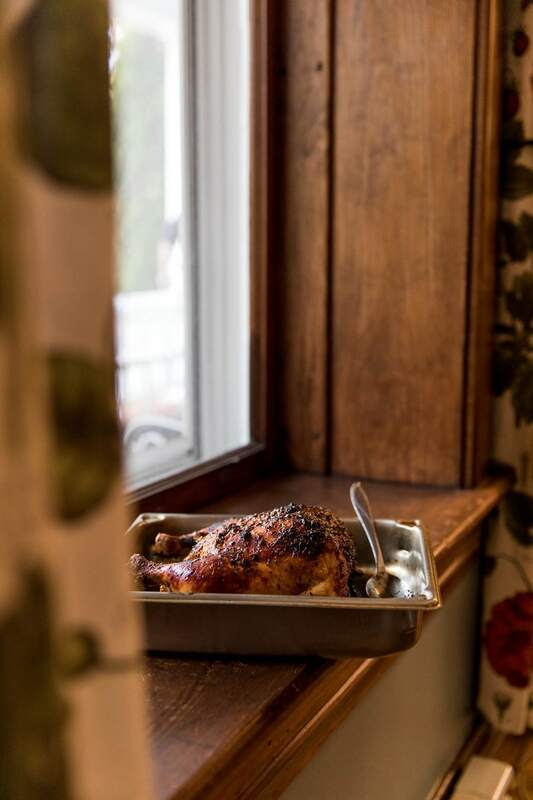 Carve into this delectable bird from Nicholas Roznowski, chef/owner at Petoskey’s COOP, and get ready for cheers. Beat sugar and vegetable oil until smooth. Add one egg at a time and beat until smooth. Add pumpkin purée and again beat until you have a nice smooth consistency. Sift together flour, baking soda, baking powder, salt and spices. Add chopped nuts (optional) and half of the sifted dry ingredients to the batter, mix. Add second half of dry ingredients and mix just until smooth. Grease two standard bread loaf pans. Fill pans evenly. Bake at 350 degrees until toothpick removes from center of bread loaf clean (about 1 hour). Rotate pans half way through the baking process. Cool, and enjoy. Serve warm or cold with butter. Here’s Nicholas’s secret formula for crave-worthy salad. Choose greens to your liking—he goes with a healthy mix of fresh spinach, kale, Swiss chard, and watercress. Rinse and dry greens, set aside. Go for a variety of fall vegetables including beets, carrots, Brussels sprouts, cauliflower, fennel, onions, etc. Having some raw, roasted and pickled items makes for a tasty contrast in flavors. For a quick vinaigrette, shake together vigorously in a jar: 2/3 cup olive oil, 1/3 cup fresh squeezed lemon juice, kosher salt and fresh ground pepper to taste. Shave on big curls of nutty, fruity Parmesan cheese with a vegetable peeler. Preheat oven to 250 degrees. Add pepitas and spread on baking sheet, bake uncovered for 45 minutes until dry and crispy. Cool. Yes, Fieldguide Farmhouse offers lodging accommodations for individuals as well as groups—the entire house sleeps up to eight. The hosts love animals and have a friendly dog Louie and cat Daisy, so well-behaved pets are welcome. Availability ranges from two to five nights and extended stays can happily be arranged. Located within 10 miles of Shanty Creek Resort and Glacial Hills Pathway, there’s lots of access to adventure and early winter’s magical peace and quiet when you return. More options: It can mean booking years in advance in some cases to score the most popular Lake Michigan rentals plus often you can’t rent one for less than a week during the summer. Not so in November, when dates are more flexible, rates far lower. First, gather some friends. At Leelanau Vacation Rentals, the company’s “Empire Beach House” lets the six of you relax from a beachside perch at just $141 a night per couple (including all fees but with a two-night minimum). Downtown is just a beach stroll away. Or gather the whole gang. “Log Home” south of Northport sleeps 21 and rents for $3,150 for three nights in November, $11,100 a week in summer.